In textile industry, woven fabrics are produced by interlacing warp and weft yarn. Faulty woven fabrics hampers the total quality of woven garments such as shirt, pant, trouser, jacket etc. 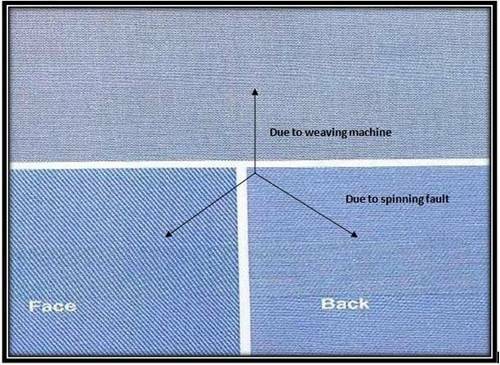 As a textile engineer you should know about the major woven fabric faults which produced during woven fabric manufacturing. 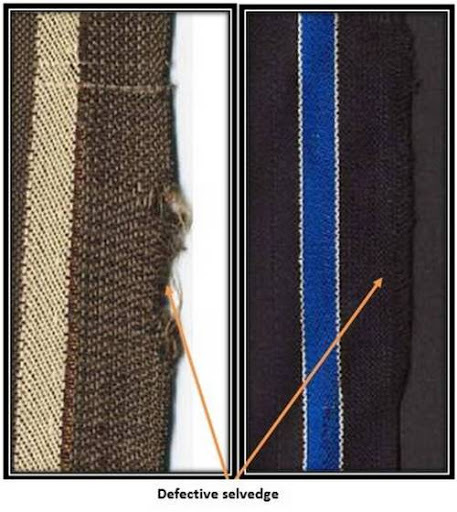 As its importance this article has shown those woven fabric faults with their images. Bad selvedge in woven fabric due to the faulty weaving. Here, warp ends being set too far apart for the thickness of the yarn or in finished fabric. 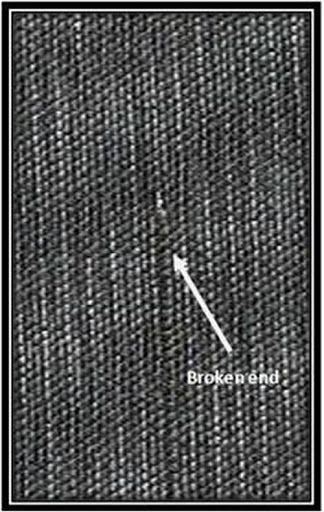 A defect in the woven fabric caused by a warp yarn that was broken during weaving or finishing. A filling yarn that is broken in the weaving of fabric. 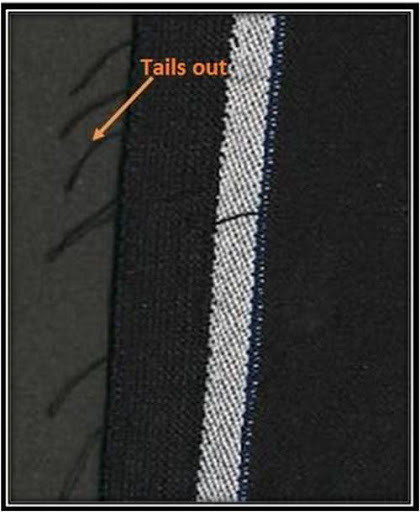 This type of fault is produced in woven fabric when the tension of warp yarn is slow. It is produced in woven fabric due to the looseness of filling yarn. 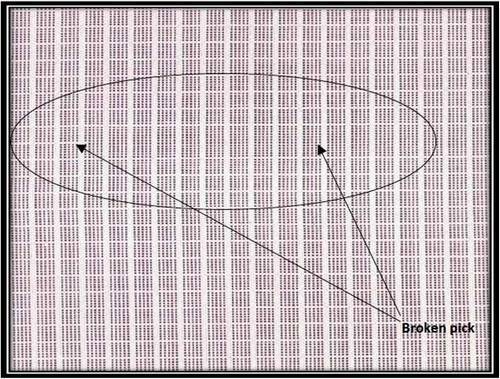 This kind of fault is produced in woven fabric when the two ends of warp sticks get together after sizing. 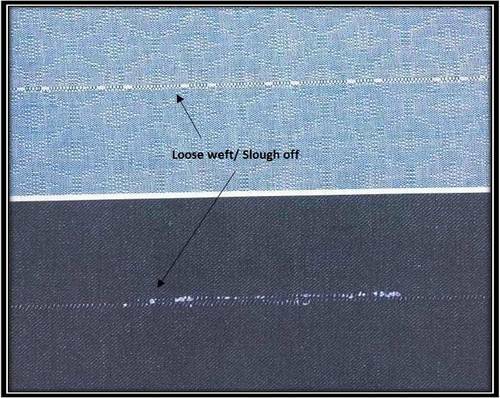 If the tension of warp yarn is more than the other ends present in the loom then this type of fault is produced in woven fabric. 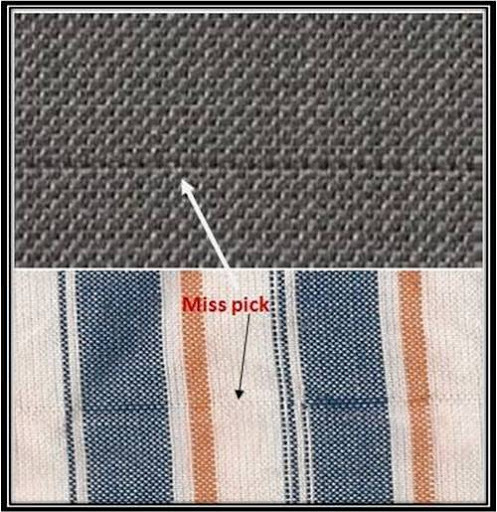 If someone pulls the fabric together the cloth roller intentionally or unintentionally then this kind of defect is produced in woven fabric. It is produced in woven fabric due to the wrong drawing of colored yarn. 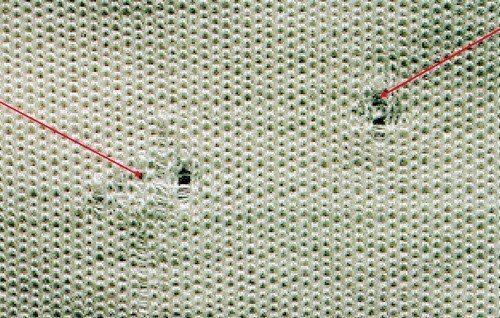 This kind of defect is produced in woven fabric when operator starts a stopped machine without picking the broken weft from the shade. It is produced in woven fabric when the cutter don’t work properly. 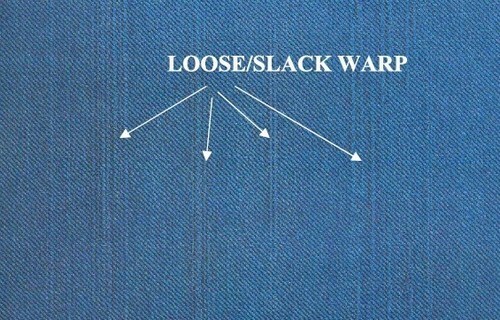 When count of yarn varies from one cone to another cone then a bar of weft will be appeared in fabric after weaving. If the warp is too much hairy then the reed will create ball in warp yarn in between reed and heald shaft. If the ball is small enough to pass through the dent of reed then those will form the ball in fabric. A fabric imperfection in which one or several yarns are sufficiently damaged to create an opening. 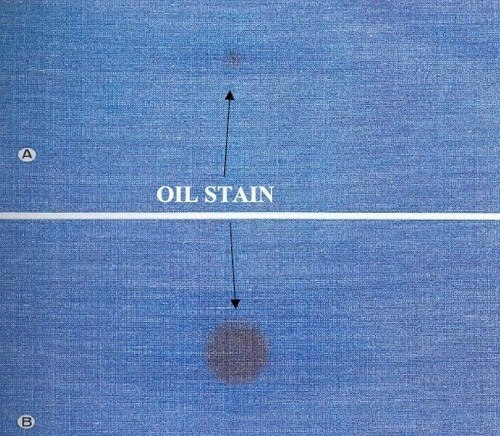 Discoloration on a local area of a substrate that may be resistant to remove by laundering or dry cleaning. It occurs during spinning, weaving or finishing. It is also often seen in the woven fabric. It is also produced in woven fabric if too much oiling has done on the loom parts. This kind of fault is produced in woven fabric if the cutter doesn’t work properly. 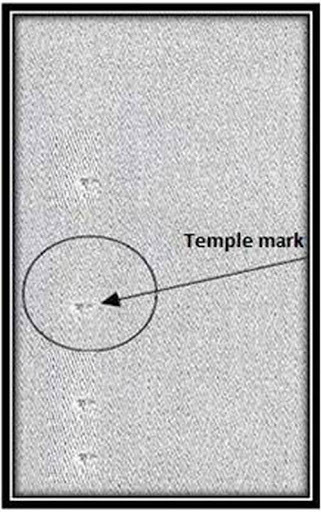 If the placement of ring in the temple bar is wrong or the pressure of temple to the fabrics is too high then this type of fault is produced. 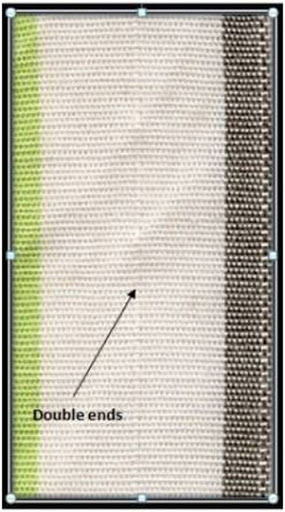 In woven fabric, a crack between the groups of warp ends either continuous or at intervals. 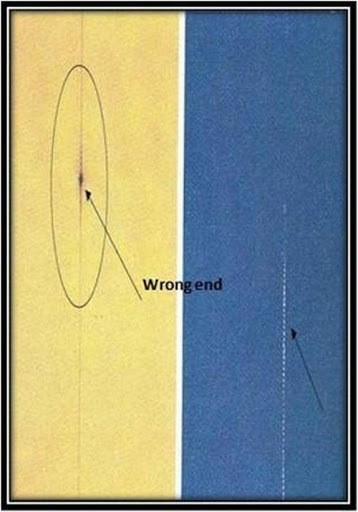 It’s may be caused by the wrong drawing-in of the warp or damage to the reed wires. If the yarn contains unexpected slub in it then those slub will be appeared in the fabric as a fault. 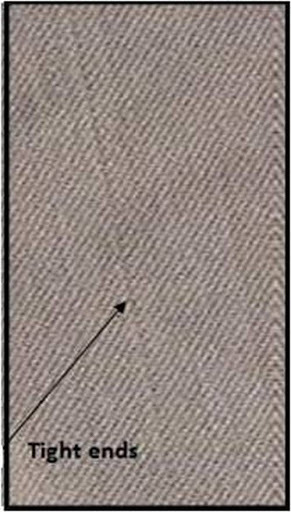 Fabric defect in which fabric count varies more than a specified percentage from the intended count. 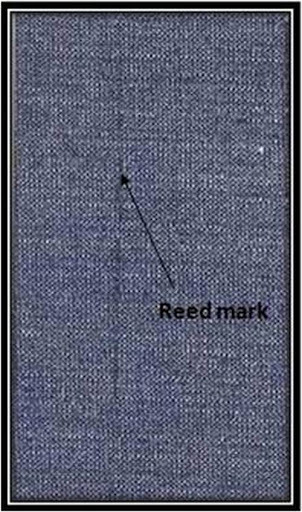 If the thick or thin place is more than one inch (2.54cm) wide then it is considered as a major defect in fabric grading. A segment of yarn at least ¼ inch (0.6cm) long that is noticeably thicker than adjacent portions of yarn is called thick place. A segment of yarn at least 25% smaller in diameter than adjacent portions of yarn is called thin place. Nice collection and classification done!!! Being Textile Professional, I appreciate such study and sharing Fabric damages. It would be very useful for shopfloor people in Manufacturing in understanding such damages cause loss in Gaments. Process control, Machines auditing and checking from time to time also training to Weaver for avoiding such damages during operation. Damage control is the topmost priority and means of cost cutting. Inspection should be just checking and packing than counting points and decision making whether Fresh packing is above 98% and customer need not to worry for any rejection at their end. 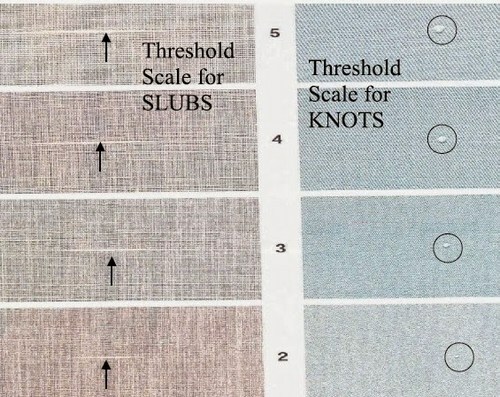 Nice description of fabric defects. Nice study done and presented in a nice format so that a person can learn also fro it. Good easy to understand. ……. It is very helpful for us who are working taking garments. Next we want more such as post. Thank you so much.Thanks all. Nice description, thanks! I am working on image processing and I want to detect all these kinds of defects, but my dataset is too bad. Do you have any picture that you can give me?